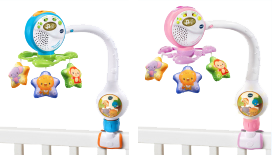 VTech is committed to bringing safe and quality toys to children. Although rare, products we manufacture may be subject to a safety recall. We take product recalls very seriously and pledge to inform customers promptly when these issues arise. The ears on the elephant rattle can break off, posing a choking hazard to young children. The clamp can break causing the mobile to fall, posing an injury hazard to an infant in the crib.